Protocols for secure multi-party computation (MPC) that resist a dishonest majority are susceptible to “denial of service” attacks, allowing even a single malicious party to force the protocol to abort. In this work, we initiate a systematic study of the more robust notion of security with identifiable abort, which leverages the effect of an abort by forcing, upon abort, at least one malicious party to reveal its identity. We present the first information-theoretic MPC protocol which is secure with identifiable abort (in short ID-MPC) using a correlated randomness setup. This complements a negative result of Ishai et al. (TCC 2012) which rules out information-theoretic ID-MPC in the OT-hybrid model, thereby showing that pairwise correlated randomness is insufficient for information-theoretic ID-MPC. 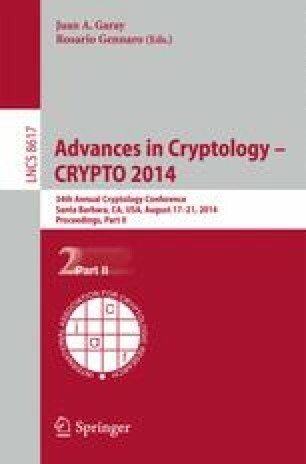 In the standard model (i.e., without a correlated randomness setup), we present the first computationally secure ID-MPC protocol making black-box use of a standard cryptographic primitive, namely an (adaptively secure) oblivious transfer (OT) protocol. This provides a more efficient alternative to existing ID-MPC protocols, such as the GMW protocol, that make a non-black-box use of the underlying primitives. As a theoretically interesting sidenote, our black-box ID-MPC provides an example for a natural cryptographic task that can be realized using a black-box access to an OT protocol but cannot be realized unconditionally using an ideal OT oracle.